Yesterday began like any other day. Except that we knew it was coming. The snow had begun to collect and glower in the sky the day before, blotting out the sun, blanketing the people of the Shires in twittering expectation.Phil had come home with dire warnings about the train system. It would be on an emergency timetable, he said. Maddie could have one heck of a job getting home from her school in the nearest market town. The day dawned with clear roads. No-one could quite believe anything was going to happen. I called Maddie’s school, though, and told them she would not be in: for if what they said was coming, really was – how would we get her safely home? The school secretary sounded stern. “Where’s the 15cm of snow then?” a friend trumpeted on Facebook. About eight in the morning it began: an icing-sugar-sprinkling which dusted the pavements, like a ravenous woman toying with her food. And then she got serious. From nowhere a great, deep, silent carpet of snow appeared. A delighted Felix tramped through the white to get to school. 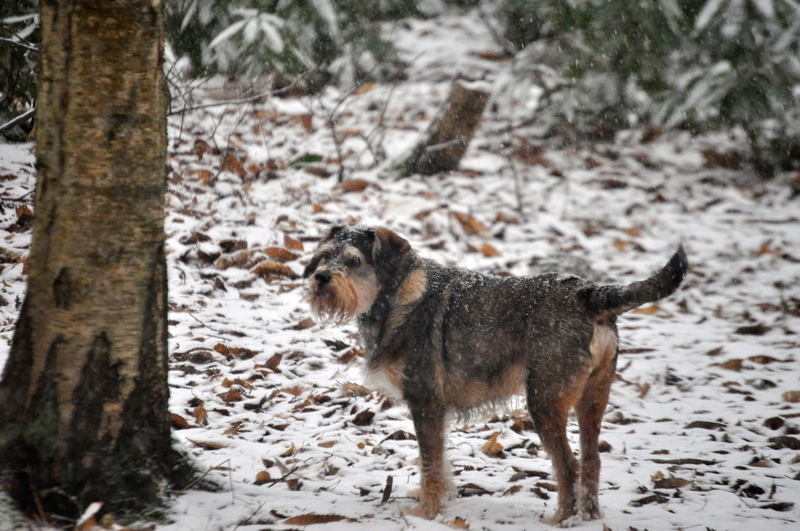 The dog’s tail was high; I have never got to the bottom of why he loves the snow. Can it really be as much fun if it masks the smells? Yet everything was a terrier adventure as I unhitched him from the lamp-post outside the school and headed for the forest. Everything must be snuffed rapturously and marked with doggy efficiency. The Forest Marshall was on patrol. Everywhere we trod, no-one had trod before. The forest was picture book white and I could not help wondering, as I crossed the tabletop of the iron ago fort, what it must have been like for those watching snow fall in ancient mud roundhouses when they were the chief form of dwelling in our part of the world. Those were the days when animals formed part of the heating system. We cleared Granny’s path, Maddie and I shifting snow and sprinkling salt, and then the news came: her school was closing at 12, Felix’s at 1. School was out and the snow was falling, remorselessly. The roads which had been speeding along just an hour before were slowed to slushy submission. At lunch it was still falling. I put on my bag-lady warmest coat, Phil’s fur hat and wellies, cutting a strange figure pottering down to school to claim my son. And once the children were home and lunched the whole town came out to play. Breughel-scenes abounded: muffled scarfed snowball-augmenters worked in industrious teams; I glanced up at one point to see a very small toddler sitting solemnly atop a sledge being pulled along the pavement. Toboggoners were seeking out the hills for thrills and spills. And by four, the snow was thinning. All through the afternoon I had found Maddie standing at windows, pondering the utter change with a quiet, understated joy. Everything was changed, changed utterly. And I said: let’s go down to the mansion. And we got on our coats and hats and scarves and gloves and wellies and headed out of the door and through a glistening white Hobbit-like suburbia to the great old house around the corner. We arrived at twilight and marvelled at the British ability to party given the slightest excuse. The air was full of festive sounds. One mother was telling her friend: “This is better than Christmas!”. The lights of the old house fell on snow etched topiary and knot gardens and a great vast glistening field surrounded by darkening, white, woods. “Let’s go and see if the lake is frozen!” exclaimed Felix. And, of course, it was. He spent copious time hurling snowballs at it. But the woods stood silently. All days must end, as must this one. Posted in Macaulay The Dog stories, Shrewsday MansionsTagged england, family, snow, weatherBookmark the permalink. Lovely dusk photos. I’m hoping for a little more light today for some later snaps! I hope everyone doing AS modules yesterday was as lucky as Scout was in being able to take the exam. It can be a trying thing, getting places, Pseu. I was meant to be working – it was just a fluke that I swapped ends of the week and was able to concentrate on family. Glad Scout made it to the exam. the school was closed, but the school laid on transport for the candidates as you may have seen on my post. Breughel would have had a tough time here yesterday if he was hoping to record snowbound partying. No one out playing, just empty snowy landscapes. But I was very happy in front of a blazing log fire. You have real snow; my mother has real snow. At the Sea Side, we do not have have snow. Rover in his capacity as Head of SPECTRE, however, has sent a complaint in to the UN about the cold. Apparently it’s undignified! Funny, that. You will notice the absence of Clive Bond in my account. He will not go near the outside. We tried him with the cat flap the other day, and he said, no, thankyou. I think- most unusually -he’s with Blofeldt on this one. Children’s delight in snow is infectious, and dogs too seem to enjoy the novelty. One the sweetest things I saw was some toddlers with their seaside buckets and spades making ‘snow’ castles. We are stranded at the moment in deep drifted snow. Lovely writing and photos Kate. Robert Frost’s poem is very evocative, and perfect for this post. Guess where I learnt it – and who taught it 🙂 Lovely pictures, thanks for sharing, Kate. Lovely photos. I don’t have any like that because our snow has been feeble, thank goodness. It certainly makes life simpler, Tilly. I heard Devon got it before us, IE. I did enjoy these photos as an indication of what our computer-crashed and homebound UK contingent are enjoying. Some days off for the teacher, schoolboy and college student in the household! We had to make do with a phone verbal report of the descending white. Oh, boo! You must insist they at least Skype you a snowman, Col! Alas, to my fury and frustration they don’t have Skype. And here we are in Australia where the temperatures have frequently been in the 40s celsius and so many homes in several states have been lost to bushfires, not to mention stock and wildlife killed …… I’d rather freeze (I think) than burn. They were 🙂 And children still listen agape to teh early morning radio broadcasts to see if this might be the one magic day when they get an entire day! I love your writing because I like snow, too, and after that line, it was like I was there. Pictures help as well. Thanks. Katie, Thank you 🙂 There is nothing quite like virgin snow in a forest. And the dog thinks so too. Lovely photos and wonderful story, fresh snow that is infrequent is the best to play in and take on adventures. You are right indeed, Lou: it is the ‘infrequent’ bit that makes snow fun. It also ensure our country always seems to be taken by surprise by it! What a magical day and pictures to prove it! Lovely piece. Thanks, Carrie. It’s been fun. Love the snow! I saw a Macauley cross for sale here for £300! Your pictures captures the ‘magic afoot’ and your words at the end bring it all home. Snow, isn’t it fun shtufffs. A clean slate, wiping away the earthy tones and gray gloom. It does has its flaws, not a perfect creature is snow. People rag and complain when they get ‘stuck in the dag gum shtufff’ for short or extended times. Glad to see you and yours got out to play and absorb it. Twilight and late night walks during a snow storm is when I think it is at its best. You just cannot beat the sound of falling snow in the woods on a moonless night -it is unreproducible music. Despite being crystallized and frozen, snow still manages to warm us up. Magical, Kate! and here I sit, envying you your snowfall, your woods walk, your mansion as we sit on more than 325 days of less that an inch of snow in the whole time – a record for this neck of the woods. Thank you for snowing upon me this morning. The fight sounds most promising, Fiona! Thanks, Hope 🙂 It was such a lovely day. I vicariously enjoyed your wonderful day. The pictures were great, especially of Macaulay. He looks good with snow sprinkled on his beard. What is it about untrod, unbroken snow? The last time we had snow and the grandkids came over, before they came inside they made a point of tramping around the front yard. Why, I asked. Because, my son explained, it was untrod. Quite. Tootally pristine 🙂 We humans love to make our mark, don’t we, PT? I remember their recent toboganning, Debra 🙂 Kids just love that stuff. Maddie and Felix have been up and down the same hill all afternoon. Great exercise! Thanks, Nancy. It was a fluke: normally I work on a Friday, but I had exchanged ends of the week witha colleague. Serendipitous indeed. A dusting of snow is such a gift. Thank you for sharing your pictures. Pleasure, Andra 🙂 Thank you for looking at them. Robert Frost really captured the moment, didn’t he, Celi? The only comparable moment to me is that one where Mole suddenly has a longing for his little home in Wind In The Willows. It was a welcome respite, Barbara, you are quite right. Lovely to pause and just look for a little while. Wonderful and I especially like an ‘icing-sugar-coating! ‘Everywhere we trod, no-one had trod before.’ – a splendid line Kate 🙂 and the photos are splendiferous. You have snow – we have a heatwave (Sydney had nearly 46 degrees celcius the other day – hottest day on record for that city). Give me the snow anyday. I love Robert Frost’s poem, your photos and story. The first snow – or another day of new snow – always made me fall in love with the winter wonderland. Everything white … outstretched limbs of trees, roads, homes and children frolicking in the snow. We don’t have snow here in Florida. Thanks for the lovely photos showing what we missed since we moved from Central New York. Great pictures of a perfect snowy day Kate. Tomorrow there’s a 50% chance of snow here in NYC, but we last had a major wintertime snowfall here two years ago. Last winter and this winter have had very little snow. It’s very strange. Climate change seems to be directly hitting the Big Apple more and more. The first few hours after a proper snow are pure magic.They never get old for me. So glad yours was a magical one, too. Love these photos – even the normally ferocious-looking Mac looks utterly enchanted by it all. Where can I favorite a post? Lovely Kate. Really lovely – photos and words. Your photos are really beautiful and they present winter / snow in gorgeous way. In Finland winter landscapes and summer differ very much from each others. In summer flowers are in hurry to show their beautiful “faces”.